Zhou Xun: Zhou Xun gets Hong Kong citizenship! Zhou Xun gets Hong Kong citizenship! Since the Hong Kong government introduced the "Quality Migrant Admission Scheme" in 2006, it has become a trend among Chinese artistes to apply for Hong Kong residence under the scheme; most recently, Zhou joined Tang Wei and Hu Jun in January as a Hong Kong immigrant under the scheme. Zhou told reporters that her application was purely for job convenience; she will still focus on the Mainland market. In espionage movie "Sound of the Wind", Zhou played the role of a decoder, Gu Xiaomeng. She said she has a love-hate relationship with the role. To wear a cheongsam for a movie "was dream come true". She had experience wearing cheongsam when she was a child and had always wanted to wear it again as a grown-up but she did not expect her dream to come true so soon. However as a spy, she also had to wear the military uniform. "I feel stifled and restricted in the uniform. I have to stand very straight in the uniform and cannot relax. That's very tiring," she said. 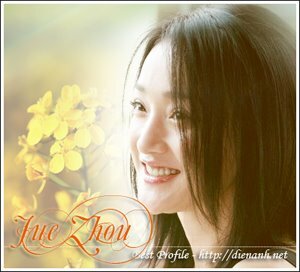 Zhou Xun: "Happy New Year"